This year’s Sustainable House Day saw around 300 people visiting MM House. 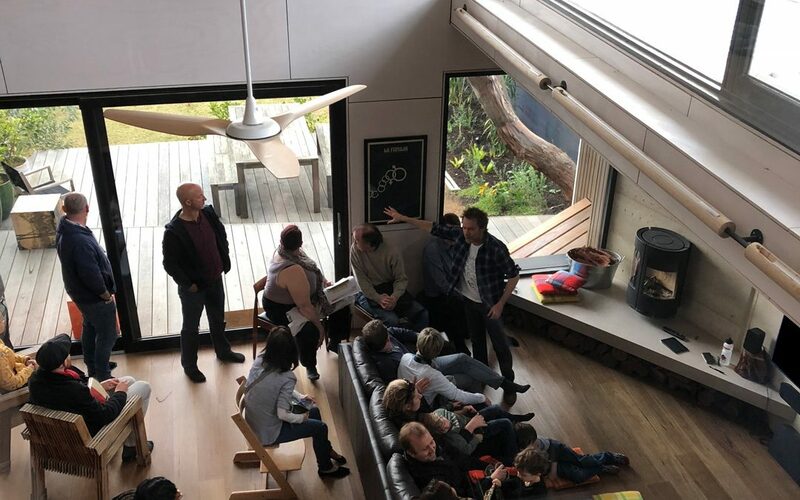 Tours were conducted from 10am – 3:15pm, to explain the sustainable aspects of this beautiful and flexible family home. 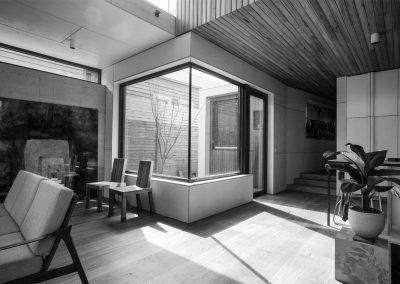 At first glance, MM House’s striking forms and spaces are uncompromisingly distinct and contemporary. However, the more interesting story is that the genius of the design comes from the site’s constraints, local context and a focus on multivalent sustainability. The house comprises three volumes, each having a morphed gable form uniquely optimised to capture light, views and passive solar. Mediated by the constraints of the heritage overlay, the gable-inspired profile nevertheless respects the amenity and echoes the charm of its neighbouring heritage bungalows. A multivalent approach to sustainability guided all aspects of this project. 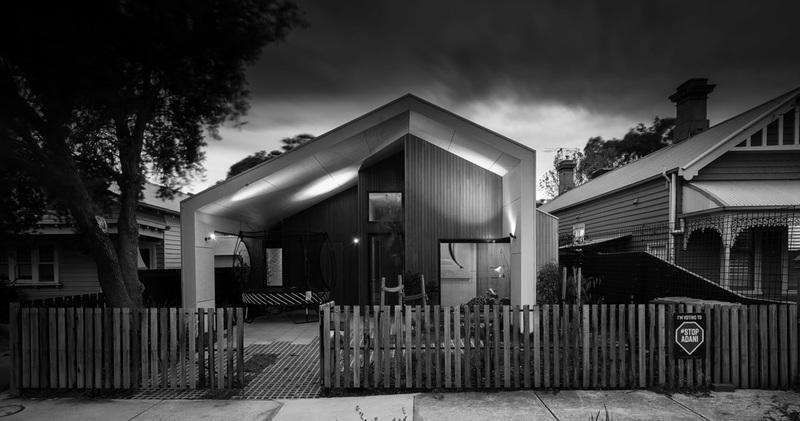 After careful analysis of the existing 1978 Besser Block home, it was evident that renovating the existing was not feasible at a number of levels, in particular building envelope, spatial planning, orientation. However, an important decision was taken to reuse all of the existing strip foundations and concrete slab. 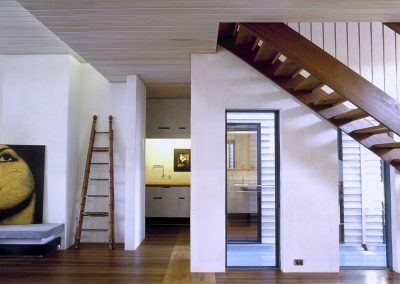 This saved massive amounts of embodied energy; it also dovetailed with keeping the build footprint compact, further energising the path to an efficient floor plan. Daily rituals, seasonal solar patterns, view corridors are synthesised. Moving through the home, one is presented with a multitude of ever-changing moments, subtly choreographed, offering unexpected glimpses within and beyond – place for contemplation and connection to the world outside. The strong architectural intent has been equally matched with commitment to creating an efficient home constructed of materials with low embodied energy. Despite the site constraints, the home is flooded with winter sun and achieves an 8 Star energy rating. In addition, the building envelope is within the realms of Passivhaus standards, including air tightness. 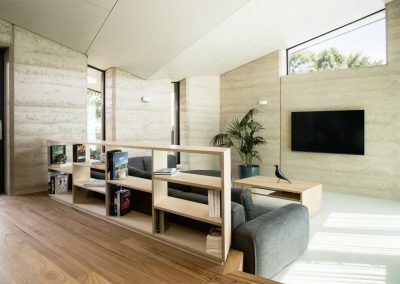 The MM House is made from rammed earth, lightweight construction, and timber cladding both internally and externally. It works to maximise the benefit of thermal mass within the structure and embraces cross-flow, heat stack ventilation. 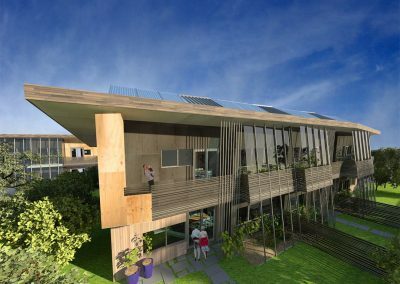 It was designed to potentially become autonomous – rainwater, greywater, solar, food production have been factored into design of the home and landscape. This carefully crafted single dwelling caters for changing family dynamics by creating two adjustable and adaptive zones, allowing for future transformation into autonomous living quarters; a home not just for now, but one to be grown into. Read more about MM House HERE.